A similar memory that I walked in my previous blog post is being embarrassed by a dancing teacher in front of other classmates. Around age of 30 one of my female friends asked me if I would be willing to be her partner at tango dancing class. I liked this girl quite a lot and considered her a potential life partner. I did made several attempts to hit on her but she responded with letting me know that she does not enjoy the way I approached her. So I was very happy to see that she invited me to a dancing class with hopes that this might be a gathering that will being us closer together. A couple of years before that friend invited me to a tango dance class I have attended many basic standard dancing classes at private music and dancing school called Tango. However that did not mean that the school was specialised in giving tango dancing lessons, that was just a name that the founder of the school picked out. We did have a couple of standard tango dancing lessons while I visited that school but I did not have any opportunities to practice dancing afterwards. When my girlfriend invited me to a tango dancing class she told me that it will be just a couple of sessions in span of one weekend. When we arrived at the dancing hall for the first time I noticed that she was surprised to find out that the kind of tango that will be taught was not a classic but the Argentinian tango. She kinda missed that detail of information. And what we found out very soon was that there are big differences between those two kinds of tango. Not only that but we realised that it was also not a beginners class but a very advanced class. So we struggled very hard to keep with the pace of the lessons or better to say, we were unable to fit in. And there was also a very unpleasant experience for me where I failed to fulfil the ideals of the dancing teacher in the most basic matter. It was the occasion where dancing teacher wanted to check out the way how our bodies move. So the first thing that he instructed all class participants was to form a very big circle. Then each one of us was to walk diagonally across the floor from one side of the circle to the opposing one. When the participants would finish the walk, they would receive an applaud and the praise about their grace of movement was given to them. Eventually it was my turn to do the walk. So I stated to move my body and I took the long walk across the hall while others would watch me carefully. However when I arrived at the other side, the dancing teacher started to lough loudly and criticise the way I walked. He said that I absolutely do not know how to walk and that had never seen anyone walk more clumsily than me. I was very shocked and started to feel ashamed since never before anyone told me that there was something wrong with the way I walked. And I became also angry about the dancing teacher since I considered it wrong to behave in so insensitive way towards his dancing class attendees. That event created quite a deep impression within me and after that when I would walk down the street I would often think that other are observing me and judging the way I walk. And there was also a related event several years later when I visited Desteni farm. Once when I had a conversation with Bernard he would with strong voice criticise the way I walk wanting to somehow show me that by waking as the way I did I am showing some kind of personality that was not in the best interest of all. And several years later I was also interviewed by some private TV channel and they also recorded some scenes of me while walking in the forest. However I never saw the recording of that interview and I am even not sure that it was aired at all. That created additional backchat and increased thinking that I am walking so strange that other even do not want to publicly show the recording of my walk. Up to this day I am still asking myself what the hell is suppose to be wrong with the way I walk. And I also did never seen any video recording of me while walking. I wonder if the way I walk had changed in the past years due to progressing in the process of self-realisation. Maybe I did walked before in a way where it was shown that my body is very stiff and not very fluid in movement due to my past professional career where I would sit in front of computer for the most of the time. Maybe I now walk differently and no one has any reason to criticise my walk anymore. Anyway, I am recently careful to pay attention on my physical body while I walk and make sure that my walk is very relaxed, that I feel comfortable and that I do not allow myself to give any attention to the thoughts where I would think that others are observing and criticising the way I walk or look like. I have considered also to specifically made an effort to record the way I walk in order to observe how I actually move for my own self-reflection. But I do not consider this very important at this time. I forgive myself that I have accepted and allowed myself to blindly accept the invitation from my friend to join her at a tango dancing class with expectation that she knows exactly what the class will be about. I realise that other people might not take proper time and focus to understand what some event is about and can come to a false conclusion. I commit myself to when someone invites me to some event and my mind produces thoughts like: “Just say yes and trust them since they must know what the event is about and that I will also enjoy it!” to stop and breathe. I then take time to do my own research and cross-reference if expectations of the one who invited me are aligned with the actual detailed description of the event plans. I forgive myself that I have accepted and allowed myself to expect that if someone is in a role of a teacher they must follow a proper conduct of behaviour and be careful not to say anything that will make their class attendees uncomfortable. I realise that any person who is sometimes also in a role of a teacher is also in process of self-realisation and that I must not expect from anyone to be nothing but perfect. I commit myself to when and as any teacher makes a degrading remark about me and my mind goes: “They should not say that and hurt my feelings since they are a teacher and must respect me completely and unconditionally!“ to stop and breathe. I then within awareness that all are in the process of self-transformation and that none of the remarks is to be taken personally communicate with the teacher and support them as one and equal in realisation how they can improve their communication with other by taking full self-responsibility for their own mind projections. I forgive myself that I have accepted and allowed myself to be hurt by the remark of the native Argentinian tango teacher that laughed at the way I walked. I realise that in Argentina they have a very different culture where most of residents practice their form of tango from a very young age and thus they also develop a more fluid and gracious way of physical body movement. I commit myself to when and as some skilled professional criticises something that I have done and my mind comes up with thoughts like: “Oh no, I am such a bad person who should be deeply ashamed of what I have done!“ to stop and breathe. I then with full understanding of the whole history of that professional communicate with them and explain that we all have different past experiences that shaped us and that they should not expect from others to excel the sam way as they do. I forgive myself that I have accepted and allowed myself for previous comments about the way of how I walk to haunt me. I realise that some comments were made from the points of separation and some were made with intent to support me in developing myself. I commit myself to when someone is commenting the way I move and I start to think: “Poor me, does really no one love and accept me for who I am?” to stop and breathe. I then communicate with the person who gave the comment and ask for a detailed explanation in order to understand if they want to actually support me or if they are only projecting their own points of separation. If I see that the comments are manifestation of emotions like spite, envy or competition, I dismiss the comments completely. And if the comments proved to be supportive in terms of showing me how my specific body movement express my patterns od self-limitation, I take them into account and use them to correct myself with. I forgive myself that I have accepted and allowed myself to when and as I go out for a walk to think about the possibility that someone is watching me and criticising the way how my physical human body moves. I realise that while someone might observe me when I am outside in the public, all judgments about my body movements are their own responsibility and have nothing to do with me. I commit myself to when and as I am outside and use my human physical body as medium of transportation or self-expression and my mind start to produce thoughts like: “Pay attention that you move in such a way that you fit into the crowd and not stand out in any way since others will start to criticise or even attack you!” to stop and breathe. I then if I am walking or running pay attention that my human physical body is as relaxed as possible and that it moves as naturally as possibly. And if I use my body to express myself while doing some movements that others might find strange, to disregard what others might think and express myself fully, following the natural flow of movements within complete oneness with my human physical body. 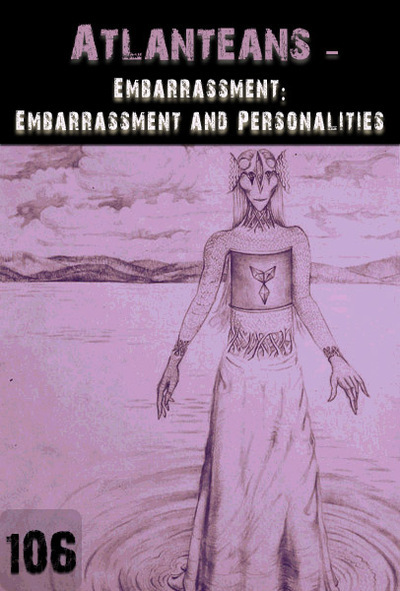 In relation to this blog post, I invite you to assist also yourself with awesome self-assisting tools within free online DIP Lite course and to listen to educational audio titled Embarrassment and Personalities from the Atlanteans series at Eqafe web store with hundreds of extremely supportive educational items that hold answers to any imaginable question about life and this existence.